Towering over London with its iconic streamline design, 309.7 metres above the bustling city below, it is the symbol of our capital’s emerging modern style. It is the epitome of luxury, with sleek shards of glass lining the entire length of the building – and a top floor observation deck with an optional champagne accompaniment. It is the eleventh tallest building in the world and the largest in the UK. I imagine you’ve probably guessed by now that I’m talking about The Shard! Situated in Southwark, this incredible piece of architecture has been the talk of the town (or should I say city) for quite some time now. Countless launches, events and even TV appearances, have been hosted in the skyscraper – and so you could say there’s quite a buzz about the place – even if it is now five years old. We all know how fascinating and breathtakingly beautiful the view from the top is, but little did I know until recently, that there was also a luxury hotel within it’s walls too. Luxury hotel chain Shangri-La opened in 2014, inhabiting floors 34-52. With just over 200 rooms, it’s still a rather hidden luxury corner of the city – despite it’s unmissable exterior. But after spending a night there myself just a few weeks ago, I want to make sure it’s shouted about from the rooftops (or floor to ceiling glass windows) because it offers an absolutely incredible experience like none other. 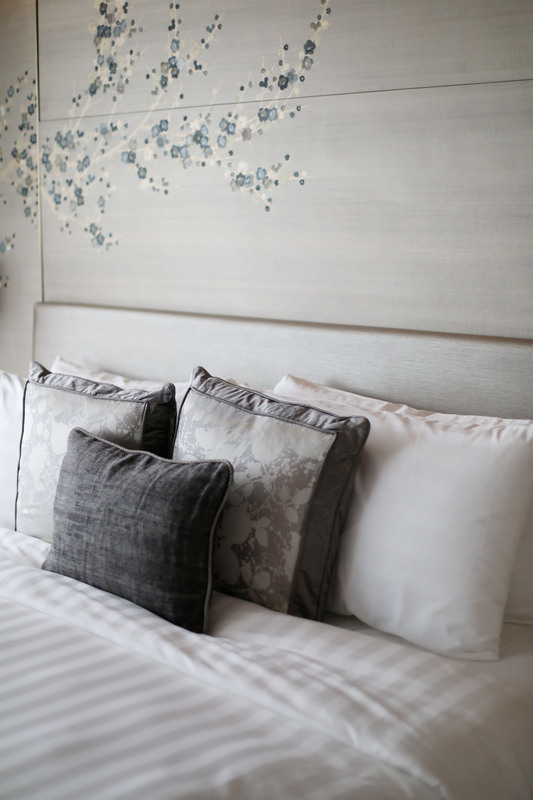 The hotel itself is everything you’d expect from a luxury chain in a bustling city – with all the high tech amenities and polite staff, however there’s something a little bit more special about this place, as it feels so tranquil and almost like you’re not in a city at all. For the duration of your time there, you feel as though you’re walking through some sort of cloud wonderland (both metaphorically and literally I suppose), as the overall atmosphere is of absolute calm. I suppose the design of each floor helps to accentuate this feeling, especially Level 52 which takes inspiration from a temple – with maze like wooden corridors, heavy doors and low level lighting. There’s a light musky scent in the air (almost a little spa-like) and instantly, you are put at ease. Every floor features the dramatic backdrop of London’s skyline, yet it takes it in its individual stride and compliments it in different ways depending on where in the hotel you are located. The pool is designed to compliment and reflect the incredible views, with the lights of the capital twinkling in the calm warm water. Whereas on Level 35, light pours in through every piece of glass, illuminating the marble check-in desks and glass table-tops. Everywhere you turn, there’s something new to take in. But it’s not overwhelming. Even if it does take your breath away! Our bedroom felt quite literally like we were sleeping in the clouds, with a super comfortable memory foam mattress, lusciously soft sheets and a view of St Pauls. 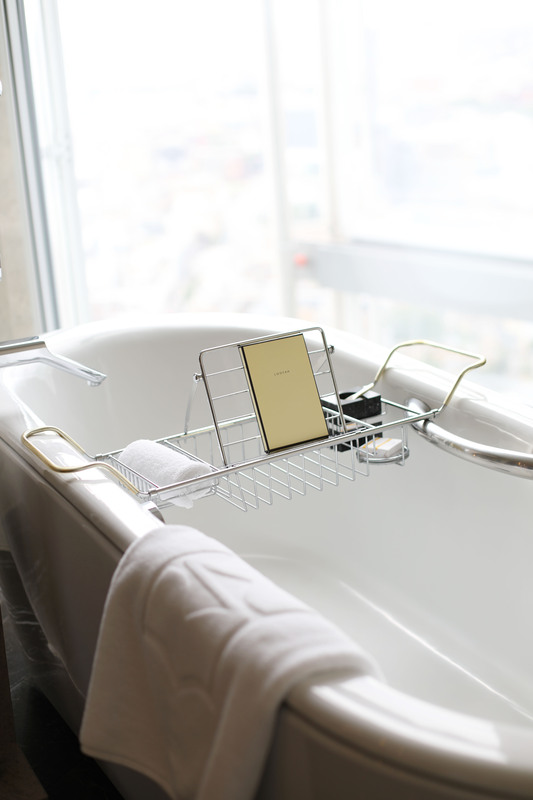 Run yourself a steaming hot bath (complete with complimentary bath salts and L’Occitane toiletries) to round off the feeling! As I’ve mentioned before on my blog, often when you find a really great hotel – there’s always something that lets it down. And that little thing, tends to be the food. So when you discover somewhere that gets it right in all aspects, you know it’s something rather special. Our first experience of the food at the Shangri-La occurred fifteen minutes after checking in, which is clearly a hotel with values aligning with my own! Because let’s face it, food is top priority! 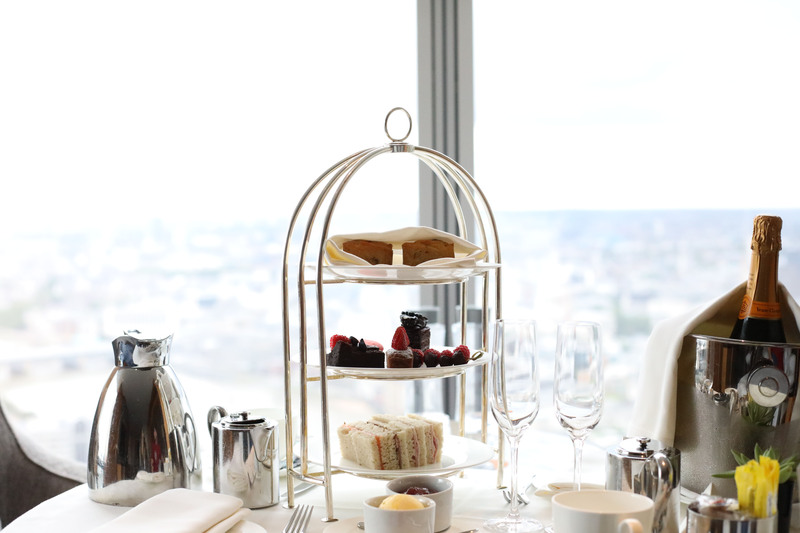 As part of the Summer in the City experience, a cart of afternoon tea and champagne was delivered to our room – meaning we could enjoy our sweet treats, with an uninterrupted view across the city, just the two of us. We popped some music on, popped open the bottle of bubbly and basked in our incredible surroundings – slightly aghast that this was how we were spending our Sunday evening. If that wasn’t special enough, the pastry chef’s at the hotel had gone to the special effort of making sure that everything was dairy, egg and gluten-free, meaning I could actually enjoy EATING the afternoon tea, rather than just looking, photographing and smelling it – like I usually have to. 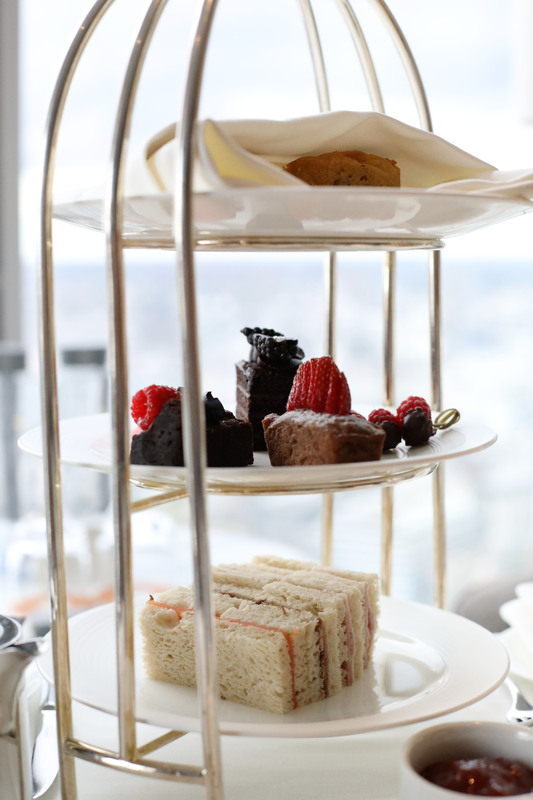 Despite the vegan diet being rather common in today’s society (especially in London), it’s still rather rare to find a place that offers an afternoon tea solution to suit intolerances. And if it does, often you feel a little fobbed off with fruit and bog-standard sorbet. 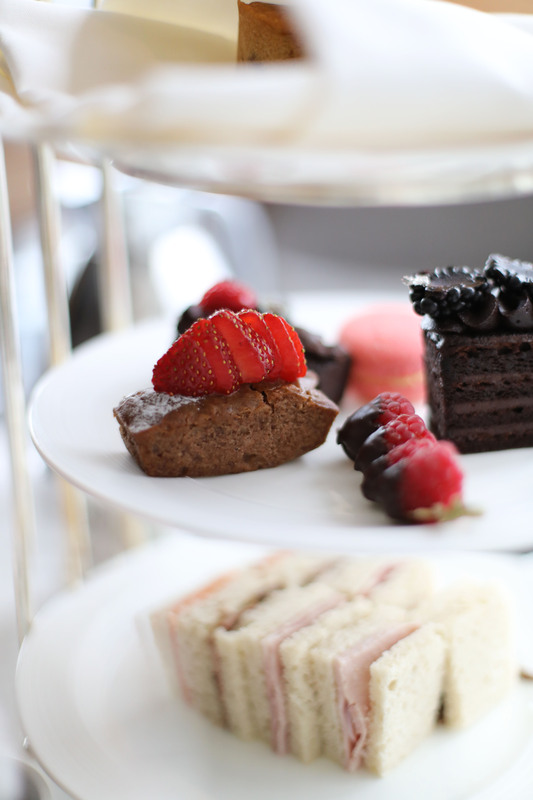 But not the Shangri-La, for I indulged in sandwiches, specially prepared scones, plant-based clotted cream, strawberry jam, ginger cake, chocolate coated raspberries, macarons and the most gooey, delicious, creamy chocolate cake that I’ve ever had. It was an incredible treat feast, made even more sweet by the awe-inspiring view that lay in front of us. It didn’t quite feel real. And in fact, it will make every date night from here forth look rather puny in comparison. Oops! 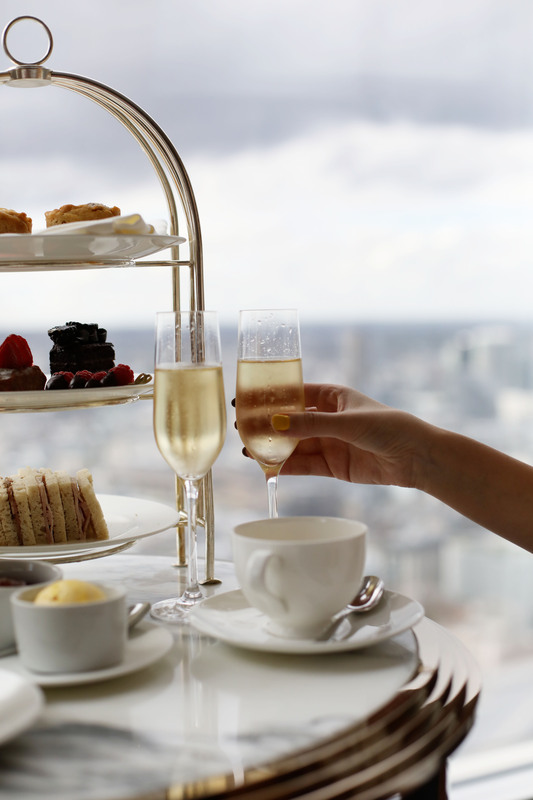 Though the most common place for a proposal is on Level 52 at GONG, the hotel’s luxury Asian-inspired cocktail bar, complete with infinity pool and a theatrical ‘Director’s Cut’ menu of signature drinks, each based on a great film director. Picture this, you reserve the seat at the bar’s best viewing spot – in the very corner where two shards of glass meet – so you get a 180 view of the city below. It only seats two people and you each have something new to look out onto – especially at night, where the twinkling lights below you inspire and intrigue. You order from the menu – yours a ‘Wingardium Leviosa’ – inspired by the great David Yates, served in a dragon emblazoned copper mug, with strong buttery and citrus flavours, Plymouth Navy Strength Gin, Butter Pale Ale and Tamarind Tea. His choice is a ‘Feel The Force’, which arrives in a levitating cup (yes it’s really floating in mid-air) and features a choice between the ‘light side’ or the ‘dark side’. The latter of which is bitter with spicy notes, grey goose vodka, manzanilla, clarified lime, campari, chilli and pomegranate. The light side is a coconut and peppermint concoction with grey goose vodka, coconut, glacial pastis and clarified lime. Both were big decisions, since there were eighteen other tempting concoctions on the menu. It’s the perfect set up for a proposal, no? Well apparently they have several a week in the very set-up I’ve just described. It’s rather magical! 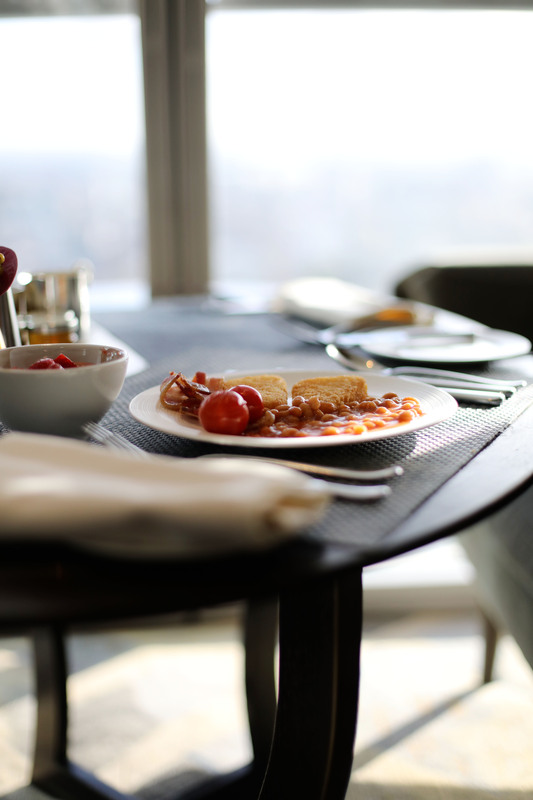 Our next experience of the hotel’s incredible food was breakfast, which certainly didn’t disappoint – with a huge buffet spread catering for all tastes. Sweet berries piled high, fresh honeycomb, chocolate sprinkled pastries – and a full English complete with beans and hash browns. It’s safe to say, I took it upon myself to try everything in sight – including an option from the a la carte menu (spinach and avocado toast) and ended up waddling back to my bedroom. Luckily, I had another few hours to relax and run myself a bath – as checkout isn’t until 12pm! While the hotel is very special in itself and would be worth raving about without the incredible positioning, the stunning view over the capital is of course a major feature. However it compliments the hotel rather than detracts from it. They work in harmony to provide the ultimate luxurious experience. Each bedroom is a completely different shape and size and are sold based on the ‘view‘ itself rather than any other feature. Ours had a 90 degree treat – as it was on a corner and therefore had different views from the bedroom and bathroom – however it’s definitely worth specifying if you have a specific view in mind, since the set-up makes it possible to facilitate your every wish! If absorbing the incredible surroundings by eye wasn’t enough, each room also comes equipped with a rather snazzy pair of binoculars, which allow you to exercise your inner James Bond and spy on the world below from new heights. It’s incredible to watch the city bustle by busily, as you zoom in on individual situations occurring. We peered through the sharp lens as workmen repaired a rail track, a speedboat carrying passengers whizzed under a bridge and even as a riverside party unfolded! So whether you decide to visit to celebrate a special occasion (or a proposal), or simply just want to spice up your date night, one thing is for sure – you’ll feel on top of the world! 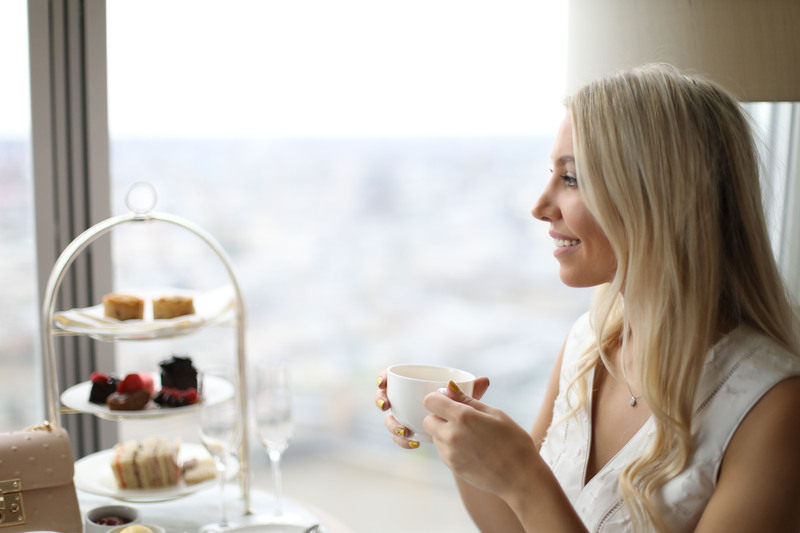 The Summer in the City experience includes an overnight stay for two, bottle of champagne-in room, afternoon tea for two served in your room, complimentary WiFi, complimentary use of gym and pool and breakfast the following morning in Ting, located on the 35th level with breathtaking views across London. In view of total transparency, my stay at the Shangri-La was provided by the hotel however all views and words are entirely my own.